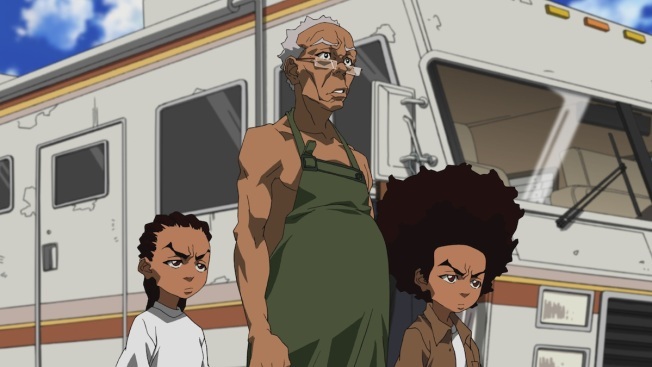 This image released by Adult Swim shows characters, from left, Riley Granddad and Huey in a scene from the "Breaking Granddad" episode of the animated series "The Boondocks," airing Monday, April 21 on Adult Swim. The brash animated series "The Boondocks" returns to Adult Swim for its fourth and final season without Aaron McGruder, the man who spawned it, but with its brashness intact. A future episode even spoofs "Breaking Bad." The weekly episodes air Mondays at 10:30 p.m. EDT. Adapted by McGruder in 2005 from his comic strip of the same name, "The Boondocks" quickly distinguished itself for its pull-no-punches exploration of the black experience in the U.S., where living, making a living and just growing up can pose special challenges for African-Americans. With its beautiful anime style but tough subjects and rough language, the series ruffled feathers while winning acclaim, including an NAACP Image Award. It also won the prestigious Peabody Award in 2007 for an episode that found Dr. Martin Luther King Jr. awakening from a decades-long "coma" into a modern world that both disturbed and disappointed him for its lack of social progress. The series "throws edgy, irreverent comment at some of the thorniest issues of our time," the Peabody committee said in its citation. 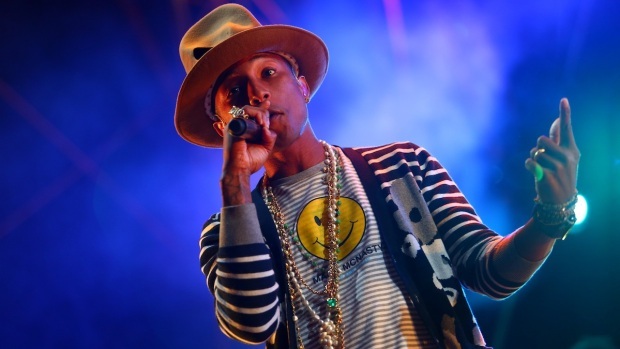 "Race relations, racial identity, juvenile delinquency — there are no sacred topics here." "The Boondocks" centers on cranky, self-involved Robert "Granddad" Freeman, the legal (but highly irresponsible) guardian of two grandsons who has moved them from Chicago's inner city to what he fancies as the trouble-free "boondocks" of a comfortable suburb. In those sedate surroundings, Granddad hopes he can shirk his child-raising burdens in favor of full-time sloth and partying. "It was important to offend, but equally important to offend for the right reasons," McGruder explained on Facebook last month, speaking of the series' first three seasons, when "I personally navigated this show through the minefields of controversy." McGruder has since departed after "a mutually agreeable production schedule could not be determined," according to Adult Swim. But he's preparing something new for the network as he puts "a life of controversy and troublemaking behind me," he said — surely with tongue in cheek — in his Facebook statement. His new project: a live-action scripted comedy called "Black Jesus," with Jesus living in modern-day Compton, Calif., as he attempts to spread love and kindness through this troubled neighborhood. It is scheduled to premiere later this year. Meanwhile, even in McGruder's absence, "The Boondocks" isn't playing it safe or just for laughs. In a future episode, Granddad learns he's broke. "I'd say you have six months before you and your grandkids are homeless and starving," his financial planner informs him, then, pondering what funds Granddad might generate, inquires, "How many kidneys do you have?" Huey's chemistry project (which in fact is an effort to make an explosive material for building bombs) turns out to be the goldmine Granddad has dreamed of: This pink goop turns out to be the world's best hair-wave cream. It doesn't just straighten existing hair, it's mega-Rogaine, growing beautifully lustrous straight hair overnight. There's just one hitch, as Huey is quick to warn Granddad: With a single spark, the stuff explodes on your head. Will this stop Granddad from cashing in on his miracle product — or getting tangled up in the dangerous black market of the hair-care industry? It's a clever parable with a lot to say about human vanity (the risk of death pales beside the promise of great hair), and about the readiness of consumer products to exploit that vanity. And it's told as an homage to the crystal-meth underworld explored by "Breaking Bad," including some shot-for-shot sequences borrowed from that AMC drama's famous pilot episode, here with Granddad (not Walter White) as a would-be drug lord in his tighty-whities, cooking contraband wave cream (not "blue sky" meth) in the desert in his motor home. As ever on "The Boondocks," the sparks will fly.